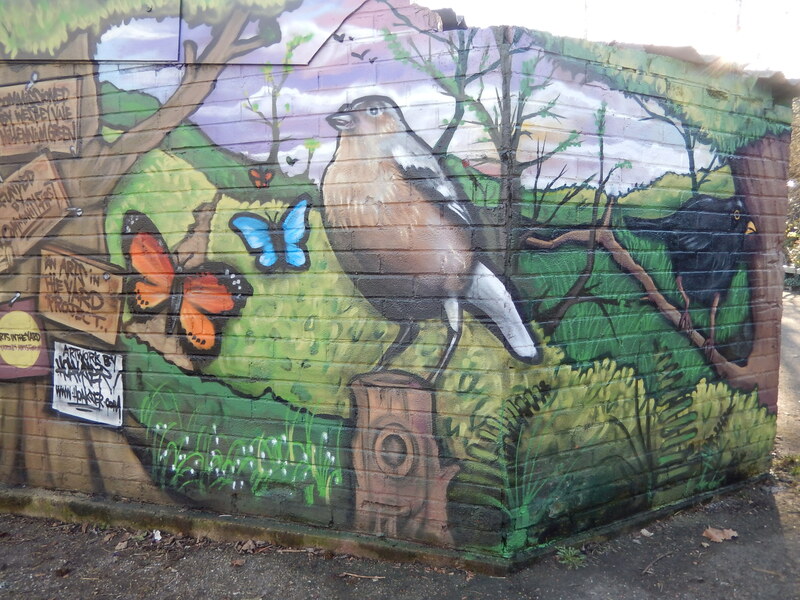 This month has seen a drab brick wall transformed in Westley Vale Millennium Green by local graffiti artist Hoakser with funding from Arts in the Yard. A whole array of native wildlife can be spotted on the mural which you can see from The Avenue entrance. Now it is officially spring and the days are longer than the nights and the lighter evenings will be with us shortly, its a great time to visit our Millennium Green. Listen out for the birds singing, (can you hear the woodpecker knocking?) Spot the ducks on the canal too. If anyone has captured photos of the nature in Westley Vale then contact us and we can arrange for you to send us photos which we can put up a gallery here. Recently seen on the canal were 3 tufted ducks, noticeable by their black and white colouring and funny little pony tail on their heads. Look out for herons too and if you are lucky a kingfisher – on the mural, but also in real life! This entry was posted in News, places on interest and tagged Acocks Green, Arts In the Yard, fresh air, graffiti artist, Grand Union Canal, Hoakser, kingfishers, mallard ducks, open space, tufted ducks, Westley Vale Millennium Green, wildlife, woodpeckers. Bookmark the permalink. Absolutely love it – has brightened up the area no end. Big thanks to whoever thought of it, and of course the talented artist who has captured some of the local wildlife in such a way to bring a smile to the face of the passer by. Have been to see the wonderful mural, what a difference to the plain old wall. Must get down to look again, I saw all the snowdrops will return to look at the daffodils. Thank you.